Waiting in Line on Black Friday? Need a Kindle Book? Do you find yourself waiting in line at Wal-Mart, Best Buy, wherever for Black Friday sales and bored out of your mind? How about a Kindle Book! A million little gods… that’s all they were – scattered here and there along the countryside. A million little souls pebbling the landscape… nothing more – as the sun cast their hollow reflections in shadows on the earth. Welcome to Powhattan – a small, sleepy town located in the center of the Clearwater Valley, and cradled within the heart of the Hilltop Mountain Range. It is home to Clearwater College (Go Mudcats! ), the Powhattan Institute of Mental Health and Awareness (PIMHA)… and the Travelers; a group of individuals hellbent on altering the very fabric of time itself – manipulating it for their own purposes – and in so doing, giving themselves freedom to laugh in the face of God. But… unbeknownst to them, time travel is, at best, a tricky widget. Variable upon variable exists – some completely incomprehensible to the human mind. And though the Travelers had scoured scientific journals and essays related to paradox theories and wormholes, as well as theories on duality, mutable and immutable timelines, and alternate histories, nothing could quite prepare them for the truth. Not even literature (that great wealth of genius and imagination) had dared ask the inevitable question that now stared them in the face (if only they knew): What truly happens when time itself is undone? Step into the bizarre world of Powhattan, and experience life through the eyes of Noah Adams (that haunted and troubled soul), Evelyn “Evie” Cain (that poor, unsuspecting girl), the Mayor (that sly old walrus), and others. Told through broken chronology and fragmented thoughts, a million little gods: the clearwater chronicles, will take you on a ride through thought and time. Amazon Prime Member? Read it FREE! "Writing is dreaming with your eyes open." - Dave Burns Available Books and Works: The Movement: A Children's Story for Grown-ups The Movement: Revisited Edem's Flight The Movement: Concluded - The Completed Anthology Pieces of Me a million little gods: the clearwater chronicles UnApologetic Uncarved: The Literature and Arts Magazine Volume 1 Uncarved: The Literature and Arts Magazine Volume 2 Uncarved: The Literature and Arts Magazine Volume 3 For a complete list of books and works, visit the author @ www.uncarvedbooks.com or www.amazon.com/author/daveburns. 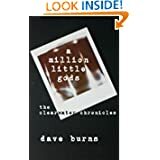 This entry was posted in Uncategorized and tagged a million little gods, a million little gods: the clearwater chronicles, Amazon, Author, Black Friday, Dave Burns, Kindle, Uncarvedbooks, Waiting in Line. Bookmark the permalink.